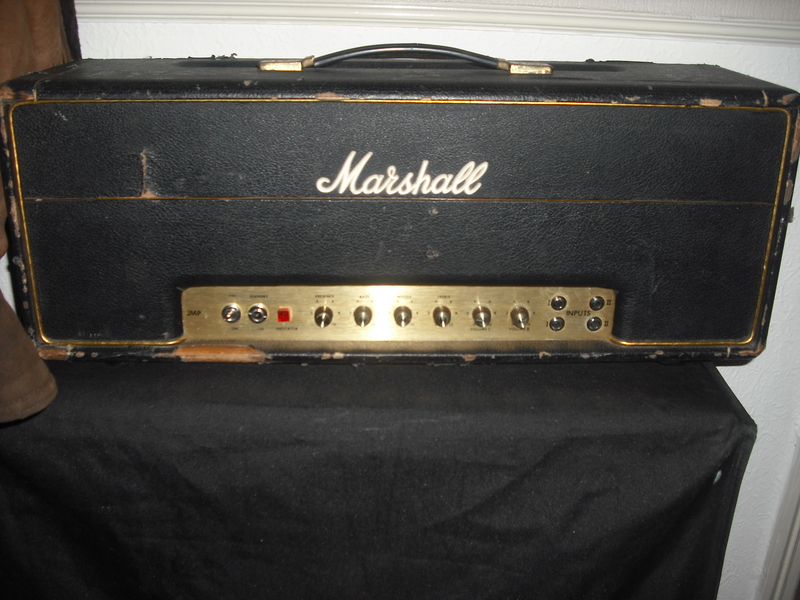 Picked up a couple of Marshall amps. Not my usual thing but a gaping hole in my gutshots collection. 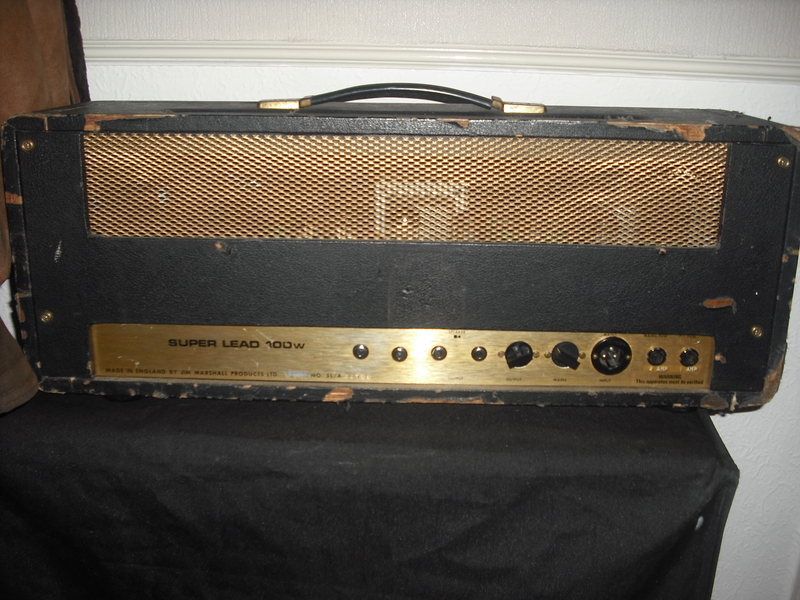 First up a 1971 JMP Super Lead. Non original switch (but I don’t know which one, I have spares of both) and well tatty. Back with badly installed effects loop. could really have done with lining up the holes. Its disconnected inside, just unconnected jacks. Handwired, but not point to point. 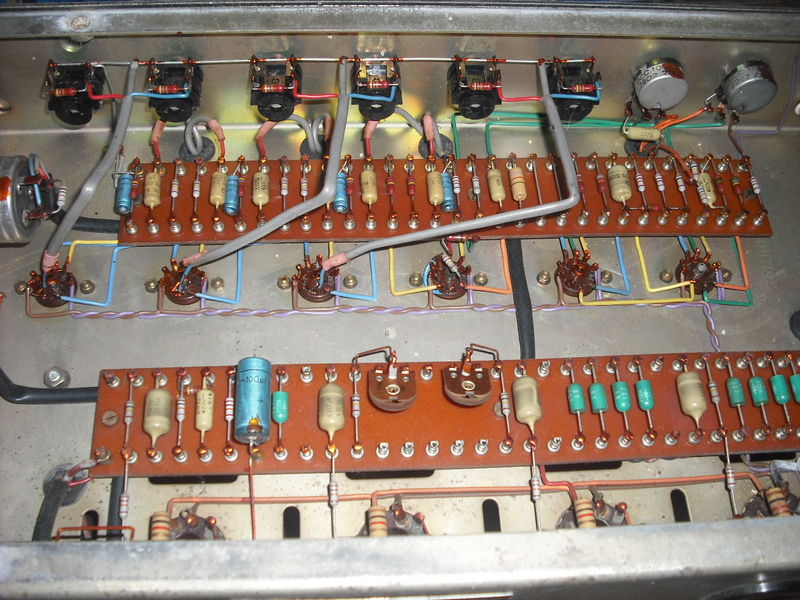 Apparently the cluster of smarty resistors left of middle is as original. guessing the one odd diode isn’t. Not super exciting in there. 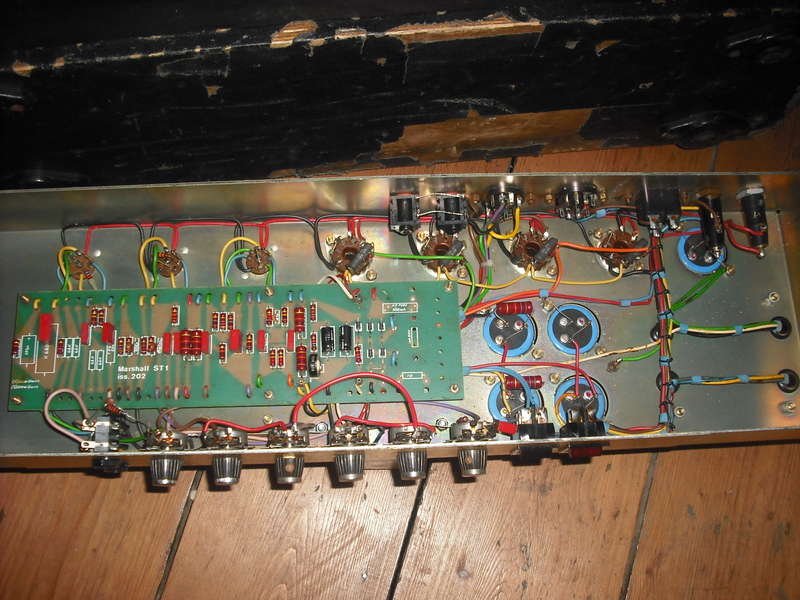 Much tidier, compare to the Laney AOR pictured earlier. One of the cats brought in a small bird which escaped behind my amp piles, so I had to move them all. Good hint its time for a clear out. Most of these have probably been seen on ebay. 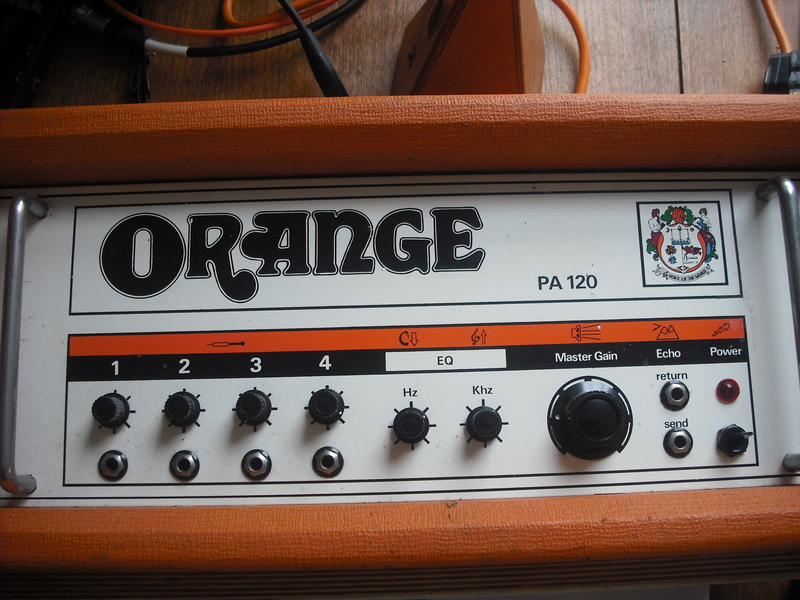 Note I’m not a pro amp repair person, just a dedicated amateur, so consider these as you would second hand amps that are well maintained not fully pro serviced/guaranteed, although ask anyone who has bought an amp from me, my after sales support is pretty good. I can ship worldwide, ideal scenario is I pack and you arrange your own courier, that way in case of damage in transit, you have the evidence and the contract. Check elsewhere in blog for pics. 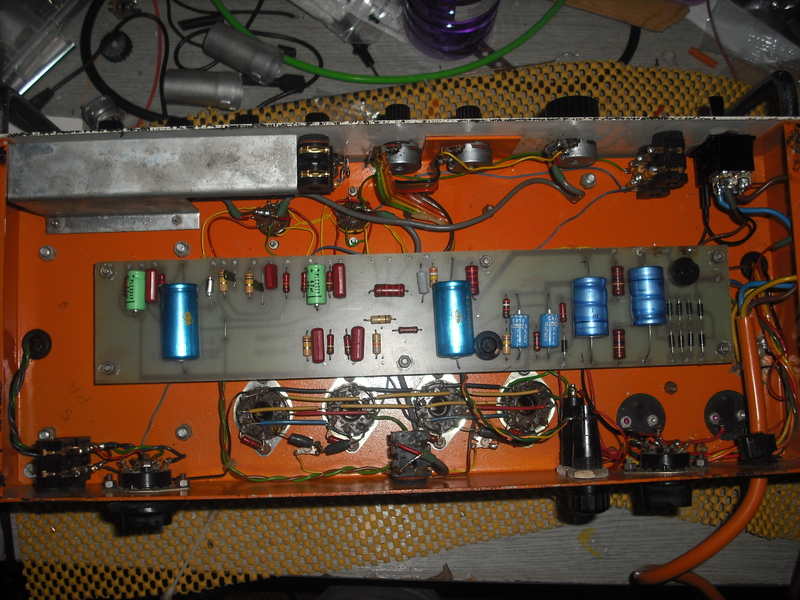 Classic British handwired valve amplifier, gives classic Sabbathy dirty tones with the Klipp circuit and nice loud Laney cleans on the normal channel. 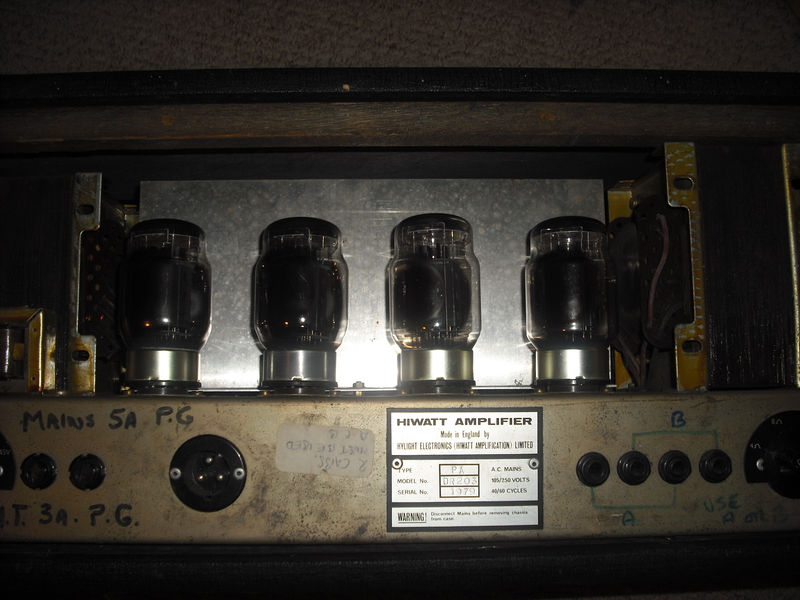 This has been revalved, recapped, pots cleaned and had various minor things fixed. 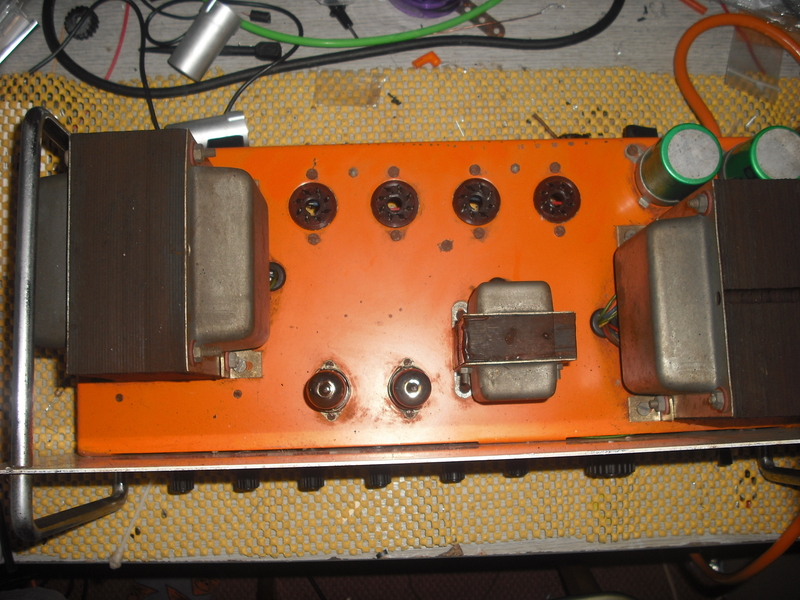 I have replaced the power lead with an inline IEC socket for convenience without having to cut the chassis. The clean channel has surprisingly little background noise (like none, was worried there was no output for a sec, until I actually played through it), guess the nice new caps were to do with that. Today’s arrival. bought as ‘working’, but that has little meaning, always do basic cleaning and check over before firing up. 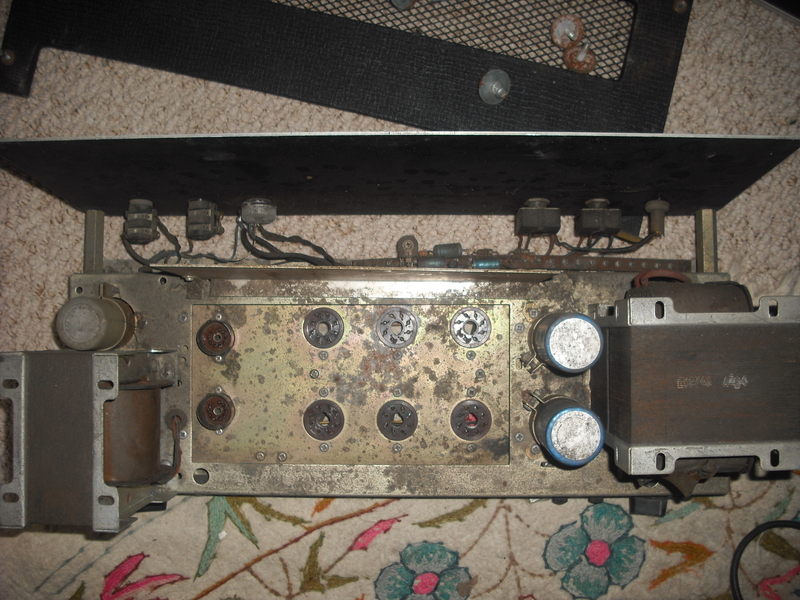 Later style faceplate that my previous one (predated this blog). Chunky enough iron. 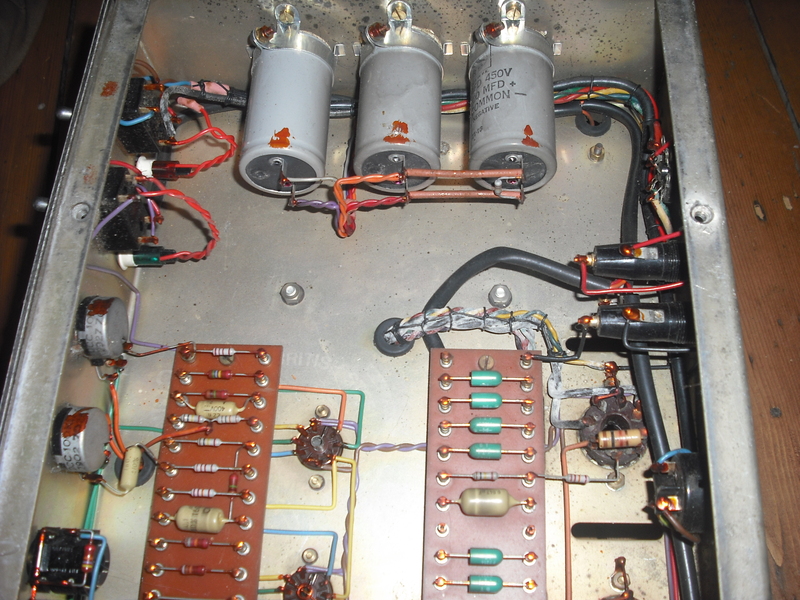 Only two pre valves from the very simple mixer preamp. Guts. On a pcb, but nothing inappropriate mounted on it. 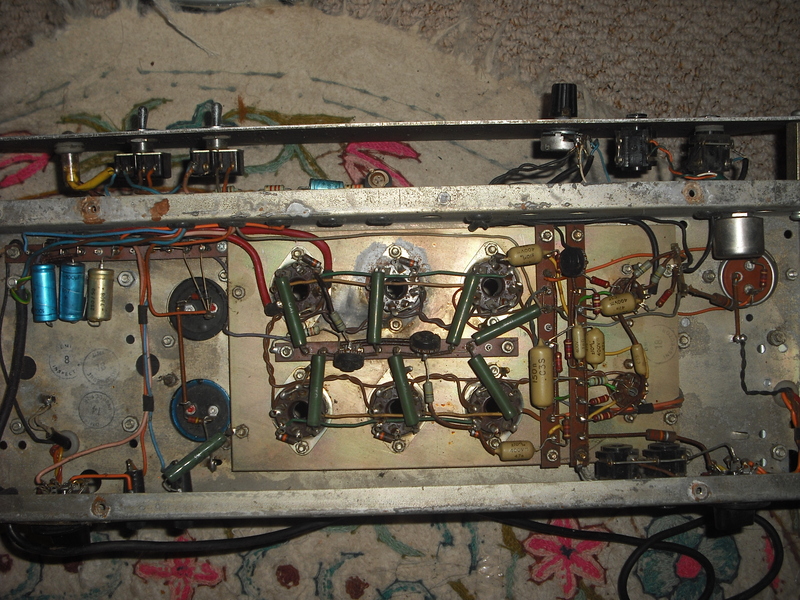 Which kind of puts it ahead of the pix only one, that had board mount preamp sockets. 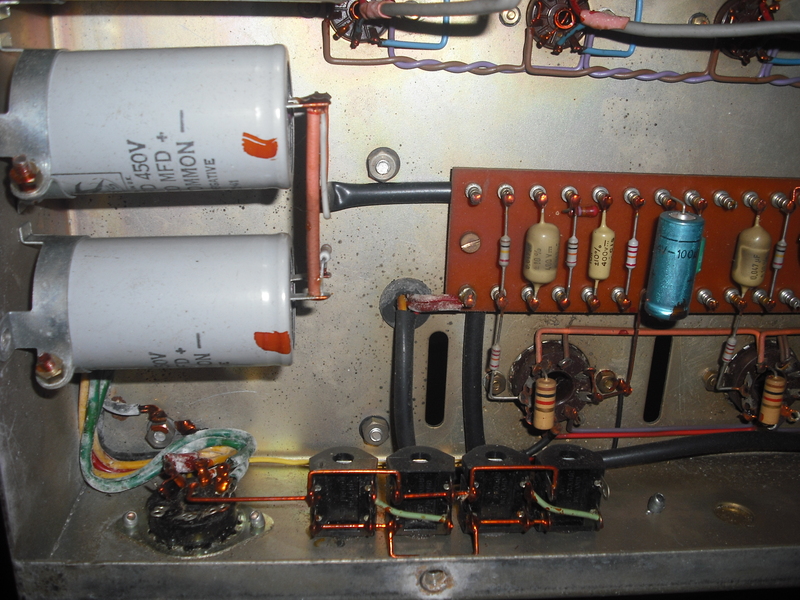 Slung a known good set of valves in and it fires up fine, bit of noise says a recap would be a good plan. 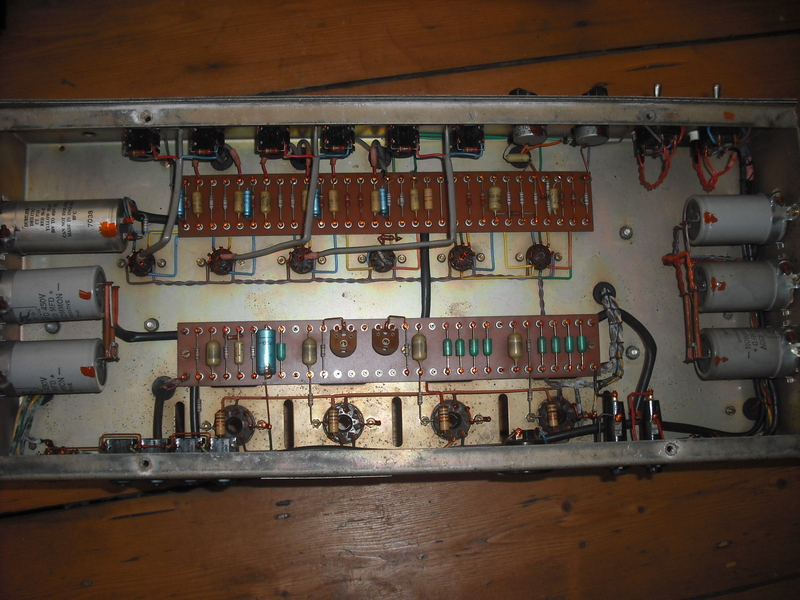 As its all original electrically, might leave as is. It has been painted black and stripped at some point in its history though. Got impatient. 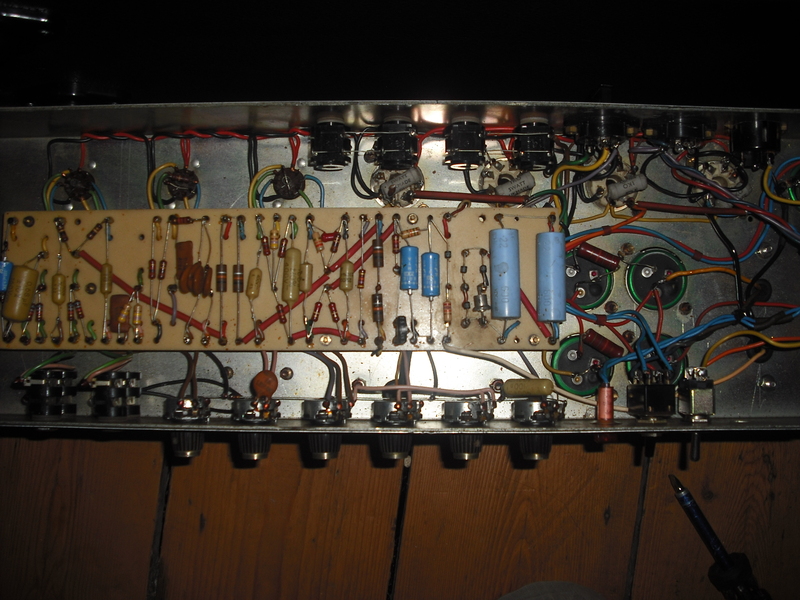 Gave it a clean up, checked fuses, loaded up some valves I had about, and it works really well, quiet (massive relief so don’t have to recap) and awesome beefy sound. EQ does enough for my purpose. Bit of a mission to go and get this. 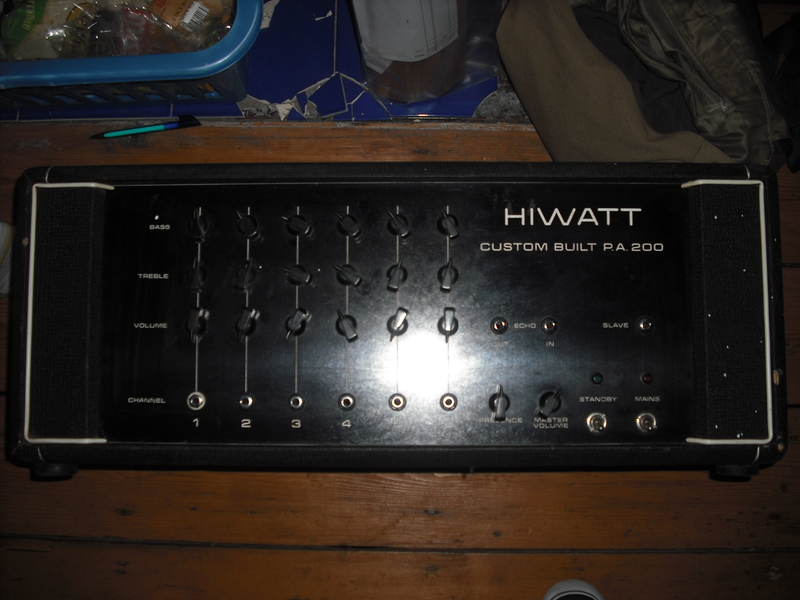 Came with no valves, but been after a Hiwatt for ages. Hope it works because the inked joins and ridiculous neatness are going to make it hard to sort out without showing. Super tidy inked guts. The inked turrets with no solder on them is odd though. Here are the pain in the nuts must have two cabs plugged in to work jack arrangement, as the amp was more powerful than most cabs could take. Overall, very similar to my Sound City 200, but neater and inked. Also had this much less interesting Sound city slave arrive. 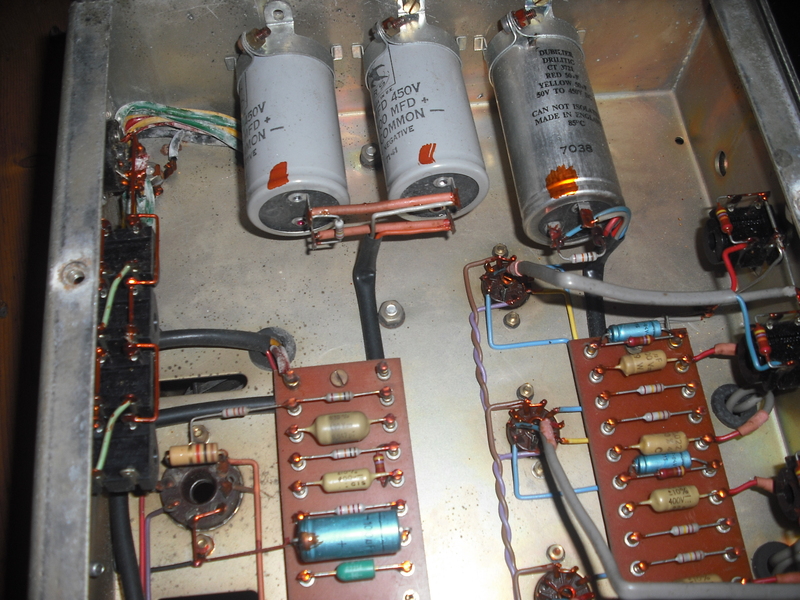 Electrovoice transformers again. Not very exciting.